Sunshine Ace Hardware has raised more than $13,000 in support of two fundraising initiatives that are helping Southwest Florida businesses and residents recover from the region’s water quality crisis. The local hardware company divided the total amount raised equally, presenting more than $6,000 to the organizations behind the two relief efforts, the Community Foundation of Collier County and the Southwest Florida Community Foundation and United Way of Lee, Hendry, Glades and Okeechobee Counties. Sunshine Ace partnered with the Community Foundation of Collier County, through its “Care for Collier Fund,” to distribute financial support to water-based businesses impacted by red tide and algae blooms. Additionally, Sunshine Ace pledged to support the “SWFL Cares Fund” of the Southwest Florida Community Foundation and United Way of Lee, Hendry, Glades and Okeechobee Counties, which are providing grants to nonprofit organizations that will help individuals whose incomes have been affected by water issues. As a company, Sunshine Ace made a direct donation to the Care for Collier and SWFL Cares funds. 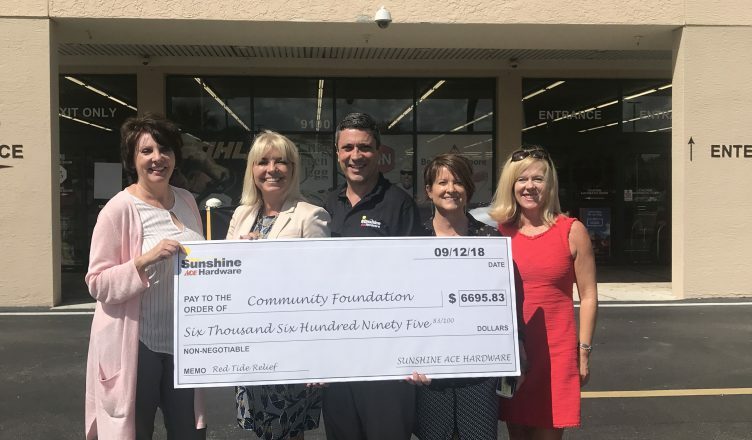 Additionally, Sunshine Ace collected donations from its generous customers and community members at each of its nine locations in Lee, Collier, Charlotte and Pinellas counties. Stores also raffled merchandise to generate additional fundraising support.